The Kaine Impunity America needs seriousness, sincerity, normality. How could he not have known that? It will be over in a month, and you’ll know what you’ve done. Hillary Clinton is leading. Donald Trump is scrambling to regain ground. The past week, three significant pieces of news. The first was Mr. Trump’s 3 a.m. tweet on Alicia Machado. Actually that happened a week and a half ago, but this week the thought really settled in: He’s going to do that as president. Once he tweeted crazy things a lot and then he sort of slowed and then he was sort of winning and then the mad 3 a.m. tweet told you: No, it will happen as president, only it will be more serious then. This is the week his friends, staff and supporters realized it will never stop. The second was Bill Clinton’s admission that ObamaCare is a mess, “the craziest thing in the world.” At a rally in Michigan he said “you’ve got this crazy system” in which millions more people have insurance, but “the people who are out there busting it, sometimes 60 hours a week, wind up with their premiums doubled and their coverage cut in half.” Later he tried to walk it back but you can never walk back an obvious truth. Mr. Clinton grew up in Arkansas in the days when America wasn’t crazy. He was alive to the realities of those struggling to keep everything afloat. Through ObamaCare they lost out. Barack Obama sees things more abstractly: Portions of the middle class may have experienced some dislocations, but progress is never easy. Mr. Clinton was speaking, knowingly or not, of the unprotected who bear the weight of the elite’s experiments. Congratulations to him for veering into public candor. In another world what he said would be front-page news every day. The third was the vice presidential debate. Tim Kaine has been smacked around for his performance, but not nearly enough. “He needs to stop interrupting,” wrote a journalist on Twitter, in real time. Actually he needed to stop being a rude little rhymes-with-witch. And he needed to show he has some idea what time it is. His strategy was clear: Block all thought, reduce everything to prefabricated one-liners. He has a weird, un-grown-up regard for the power of sarcasm. Supposedly this would all play well with the common man. No. 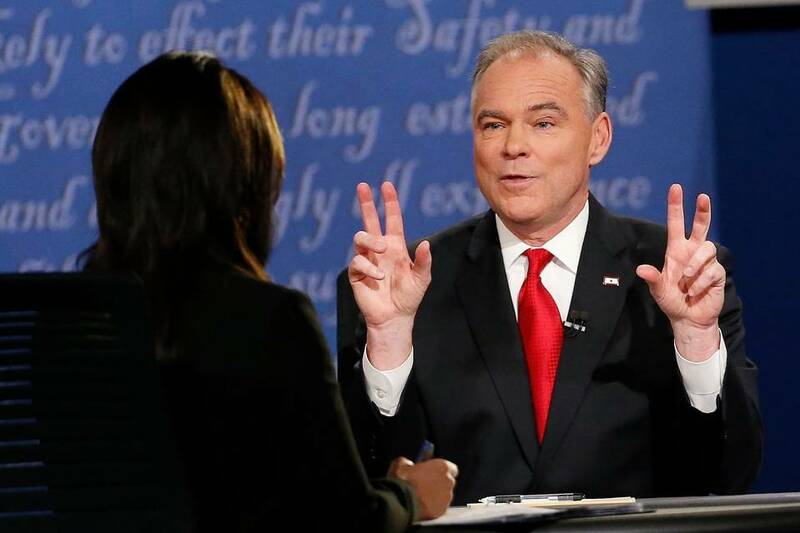 Mr. Kaine was like the snotty midlevel manager of a box store who comes in after a fight with the wife and starts yelling that your bathroom breaks are too long. His antics kept the debate from developing into a series of thoughts that could be understood and absorbed. This was a destructive act that kept serious policy from being seriously discussed. He made it cheaper than it had to be. Everyone says vice presidential debates aren’t that important, and everyone must be right, but this is how it changed the race: Now there are two Democrats to dislike, not just one. And you can imagine Mike Pence—calm, sly sometimes, occasionally evasive—as a plausible president. The real sin in Mr. Kaine’s performance had to do with his not knowing what time it is. After the past 16 months the nation craves in its politics seriousness, sincerity, sheer normality. This is a time that most desperately demands a little class from its nonpresidential candidates. Voters need to see that not everyone in politics is a sleazy manipulator, a mere aggressor, a game player. Do our national candidates and their staffs not know what a relief it would be to see dignity and maturity? Do they not understand that the nation needs a break from the two weirdos at the top of the ticket and yearns to be inspired and reassured by the bottom? How could Mr. Kaine not know that? We end with the debate’s redeeming feature, which surprisingly had to do with God. Ms. Quijano noted that both candidates are Christians who have spoken of faith’s role in their lives. She asked each to speak of a time when he struggled to balance personal faith against public policy. It sounded believable and even heartfelt, though his ultimate decision—do what is politically popular—was convenient. I rarely hear politicians, even pro-life ones, talk like that. It was startling, and lovely. He spoke of partial-birth abortion. He knew, he said, that Mr. Kaine is personally against abortion, but “the very idea that a child that is almost born into the world could still have their lives taken from them is just anathema to me.” Mr. Kaine responded that he and Mrs. Clinton support Roe v. Wade, while Mr. Pence would overturn that decision. It went round and round. But for a moment there things got serious, even sincere. Imagine that, in 2016.